Morning sickness is awful. At best it’s a nuisance for a few weeks; at worst it’s debilitating for months. I’ve had both scenarios, so my sympathies leap out to any expectant mother who suffers. when I wake, throw up in the sink before breakfast, and pull over at gas stations to get sick on the drive to work. I collapse on the couch before sunset most evenings, too tired to drag myself to bed. I am three months pregnant. This is my body, given for you. Maybe Mary knew morning sickness’s months of misery. Or maybe God mercifully spared her this added burden on top of the worry and fear and shame she might have endured at being pregnant before marriage. But either way, Mary knew the unexpected upheaval that pregnancy always brings. And she let her heart turn this truth into a hymn of praise to God’s great blessings – the God who comes to the help of his servant Israel, who remembers his promise of mercy. But this time through the twists and turns of all-day sickness? I realized I had never written a prayer for it. So here’s my meager offering – in solidarity with women who know too well the words hyperemesis gravidarum, who stop keeping track of how many times they threw up today, who know the sacrifice is worth it but still struggle to get through every nauseous hour. “A Prayer for Morning Sickness © 2015 Laura Kelly Fanucci” can be found permanently here, among my collection of Prayers for Pregnancy. Thank you! Pregnancy no. 2 here, and morning sickness is lasting longer than pregnancy no. 1. 🙁 It comes out of nowhere, and I don’t know how to get through the moment. No. 1 wants to go outside, and I want to lay on the couch. I make dinner only to eat a bowl of cereal. But the reminder that this will not last forever, that others suffer with physical heath every day with no relief, and some that wish this day to last forever are a perfect reminder for today. And from a previous post; I also LOVE being pregnant during Advent. No. 1 was a secret to everyone but me and my husband during the Advent season and it was so special and exciting as we sat grinning in the pews. This time around everyone knows, but still the waiting with Mary draws me in every time. All you santly mothers who are now in Heaven, pray for every pregnant mom on earth in every country …and Natalie of course. Thank you for this sweet prayer. Ive been full of anxiety. Pregnancy number 4. I miscarried my third one at 12 weeks about 5 months ago. It ended terrible , needed 3 blood transfusions. I can’t find peace in this pregnancy. I have fears of the same thing happening I am 5 weeks and can’t cope. Lord give me strength. Thank you for this. This is my third pregnancy of severe first trimester nausea and fatigue (fortunately never crossing into HG) and the despair is always waiting as I drag myself through the days. 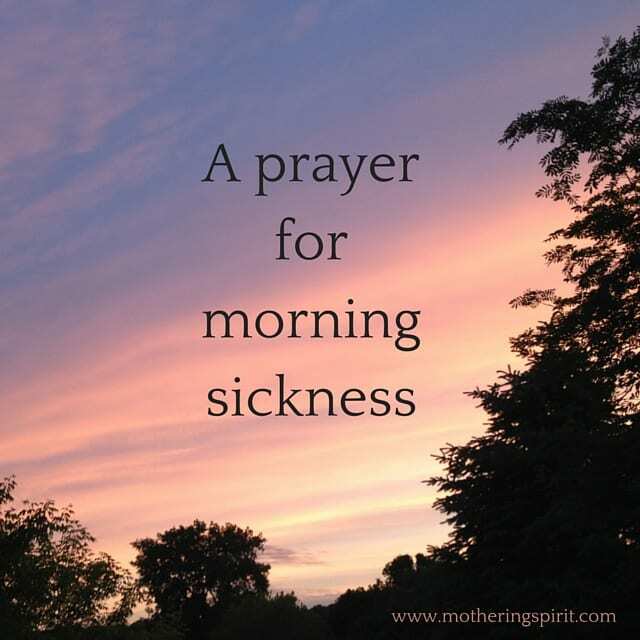 I’ve been trying to understand morning sickness spiritually, and this prayer made me cry tears of recognition. Thank you so much. Thank you so much for this prayer! I’ve been saying it all day( along with my sickness) this is my second pregnancy. First one I was nauseous too but this one by far is the winner for making mommy the most sick! It helps to read all the other moms comments, you really do feel alone sometimes like you’re the only one going thru this. Praying hard for you!! I have suffered through HG (hyperemesis gravidarum – extreme morning sickness) through my pregnancies, and I know it is such terrible suffering. I hope that you can find support from health care professionals and friends/family to make it through each day, hour by hour, to care for you and your baby!